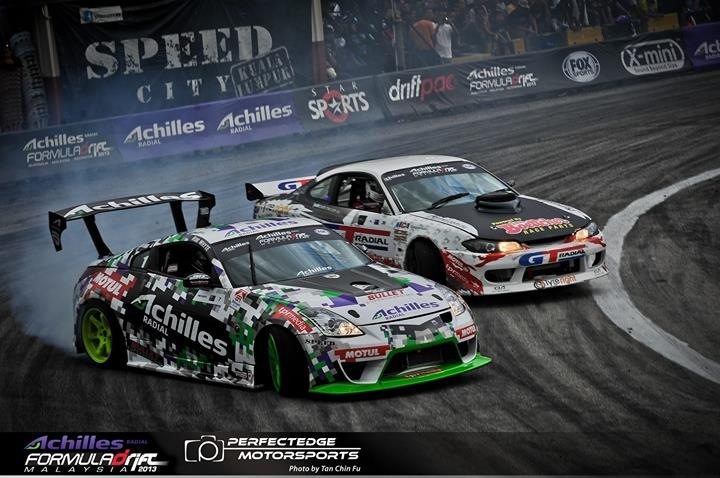 Round 2 of the 2013 Formula Drift Asia series in Malaysia has been one of the craziest events ever for our team. 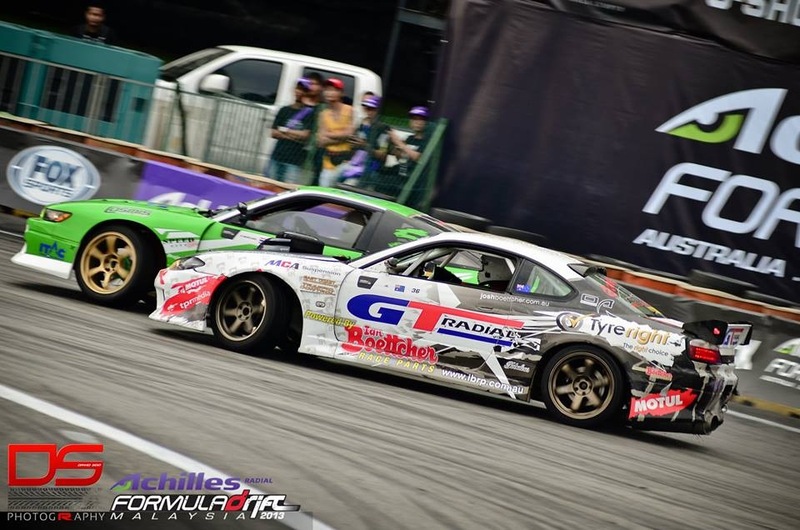 After completely changing the engine and drivetrain of the GT Radial S15 in only 2 weeks before shipping it to Malaysia, we unleashed the GT Radial V8 S15 for the first time in a foreign country, at a huge event! We were hoping that all the hard work would be worth it, and… it was! We sorted out the carburetor settings for the different climate and did a quick check over the car, we took it for run and WOW! The power and torque of the big V8 was very different to the turbo 4 cylinder and made it very easy to have huge amounts of smoke pouring off the GT Radial SX2 tires! After the test we made some alignment and tire pressure adjustments and turned our attention back to the carburetor to try and make sure there would be no issues through the weekend. Friday was the day to sort things out. 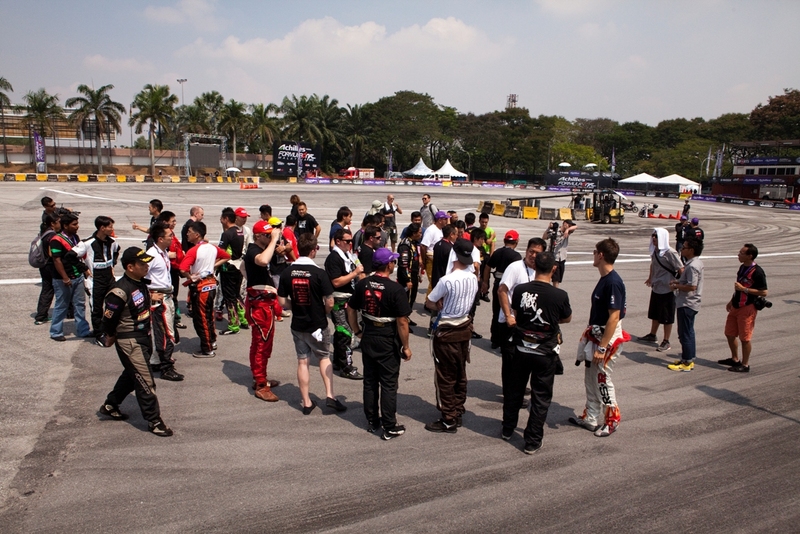 All the drivers and teams were at the track to check, adjust, setup and ready their car for the competition ahead. Our crazy race prepared V8 swap into the lightweight Japanese chassis drew a lot of attention from the drivers seeing it for the first time. After a driver briefing and track walk with the judges on Saturday, it was finally time to let the beast loose on the Formula Drift track. I quickly realized that lighting up the tires was no problem at all! It was a just matter of using the throttle to find the grip instead of holding it flat like I was used to doing with the turbo engine. 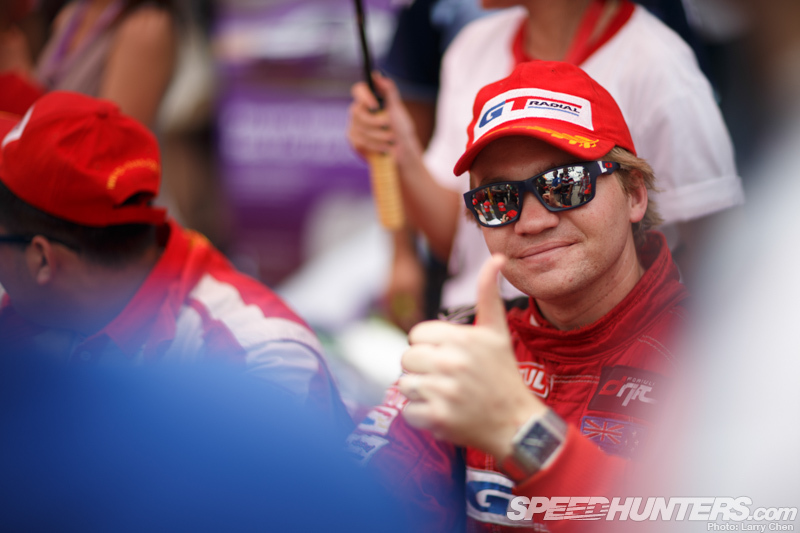 A tricky practice session was unfortunately cut short by a fairly common sight in South East Asia, a storm and torrential rain – all while we were still learning the car and hadn’t found our feet with the setup yet. Luckily Saturday was a focused practice day and we were able to make a few changes Sunday morning to get the car more dialled in ahead of qualifying and battles! I knew that making it in the main game wasn’t going to be easy. There were 33 strong drivers all trying to qualify for 16 spots in the competition and I only had 15 laps under my belt with the new engine. I threw everything at the first of 2 runs and ended up in 9th place, only one place outside of locking in a top 8 spot after one run. Next run I stepped up the speed and eventually qualified in 10th with the car feeling much better to drive! 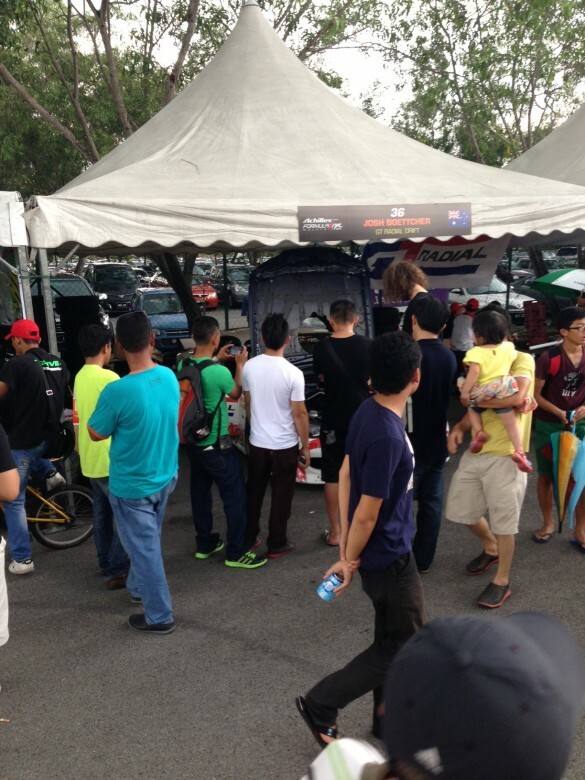 We then enjoyed some crazy Malaysian heat during the drivers’ autograph session! The car and our team received huge attention during the event. 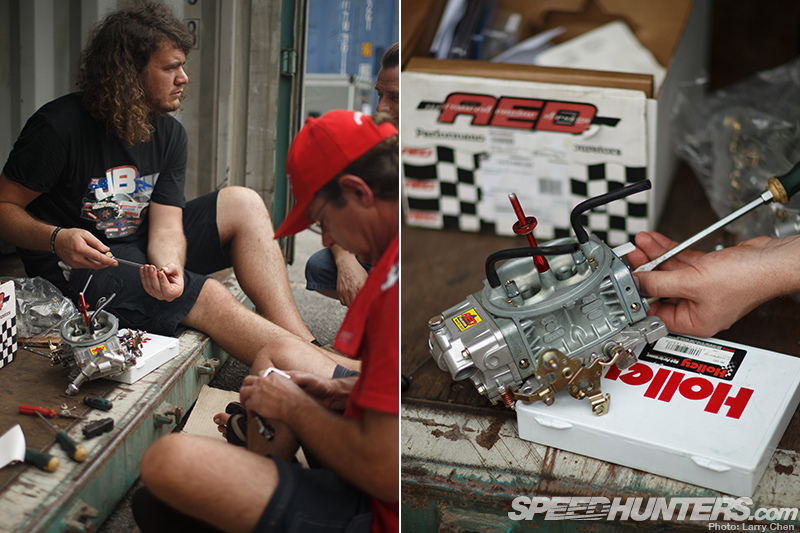 There was always a crowd around the car checking out our incredible engine setup that has never been seen before at drift events in Asia! Soon it was time for the top 16 introductions and opening ceremony. During this we watched some pretty serious dark clouds rolling in, but the show must go on and it was time for the top 16 battles! After our teams and cars had both travelling to another country, I unfortunately was up against fellow Aussie and good friend Rob Whyte in the top 16. We weren’t happy as both of us would like to make it as far as we could and we knew only one of us was going past the first round. We’ve had a huge number of intense battles in the past in Australia and despite the circumstances, neither of us planned to hold back this time! I was first to chase and charged up beside Rob as close as I had been to anyone all weekend. I stayed right on his door for almost the entire run – this new engine was awesome to chase with! Then it was my turn to lead. I took the deepest line I had all weekend and after a small error from Rob while he was chasing, I was through to the top 8! It was another tight battle for us and the team was pumped. We knew Rob had been quick all weekend and we’d nailed the setup right when it counted. Next was the top 8 and I was up against ‘S’ from Thailand. Before the battles began those big dark clouds opened up and quickly turned the already tricky and bumpy track into a slippery and unpredictable challenge. 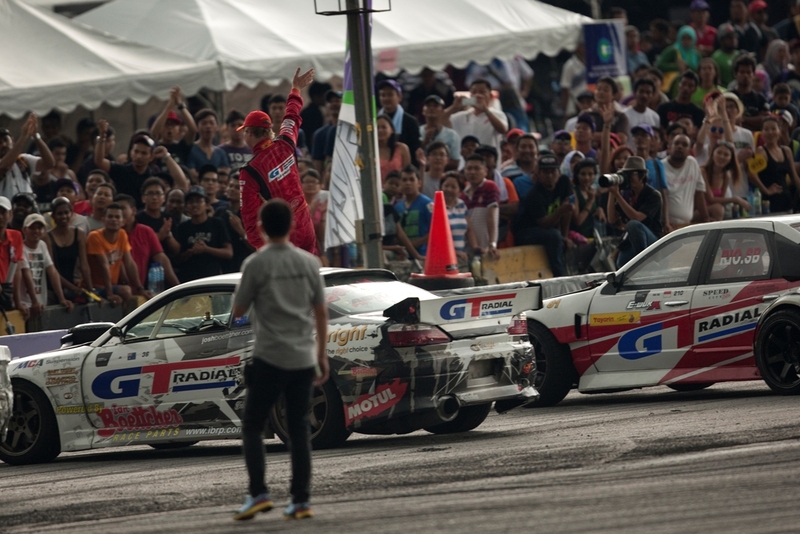 During first battle of the top 8 group, both competitors spun independently of each other and the battle went to a re-run. 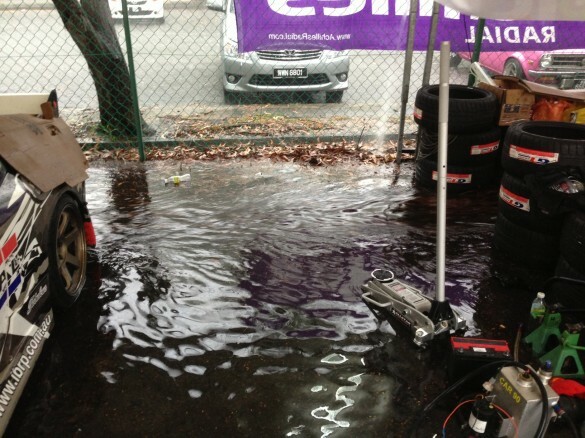 We knew it was slippery so we dropped the tyre pressures a little to help with traction in the wet. I wasn’t phased by the track conditions. In fact, I quite like a wet track and have had a few victories in the wet in the past, but I certainly hadn’t had enough runs with this new motor to know exactly how the car would behave. We lined up for the run, I was in the lead position and S was chasing. 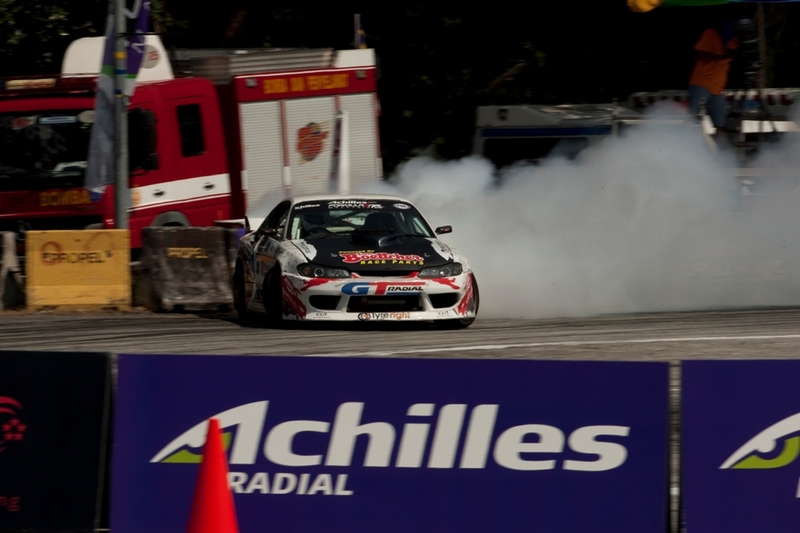 Formula Drift don’t have any practice runs before each battle so we were straight into it. 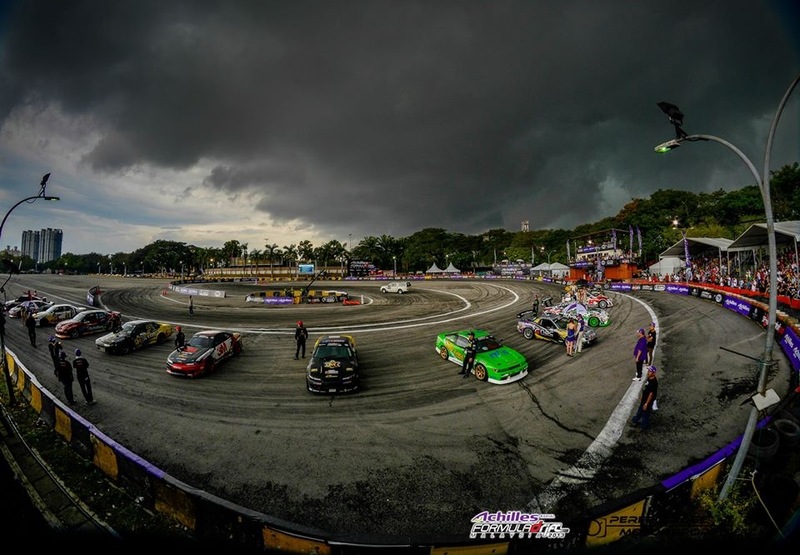 As the lead car, you test the track as you go and the chase driver can gauge the conditions as you go on ahead. As I entered the first corner, I put some good angle on just before a large bump in the track and as I hit it, I quickly realised I’d pushed a bit too hard on entry. I tried everything to stop the slow motion spin but just couldn’t bring it back and spun around in front of S. He continued past and I knew it wasn’t looking good now. I was fired up for the chase run and did everything I could to try and make up for the error. I was right next to him for the whole run and even had the judges clapping after the run. But, with no mistakes from S it meant I was out and he would continue on, eventually taking out 1st place to win the event! With the challenges the team faced and the tough competition and conditions, we were very proud of our efforts. 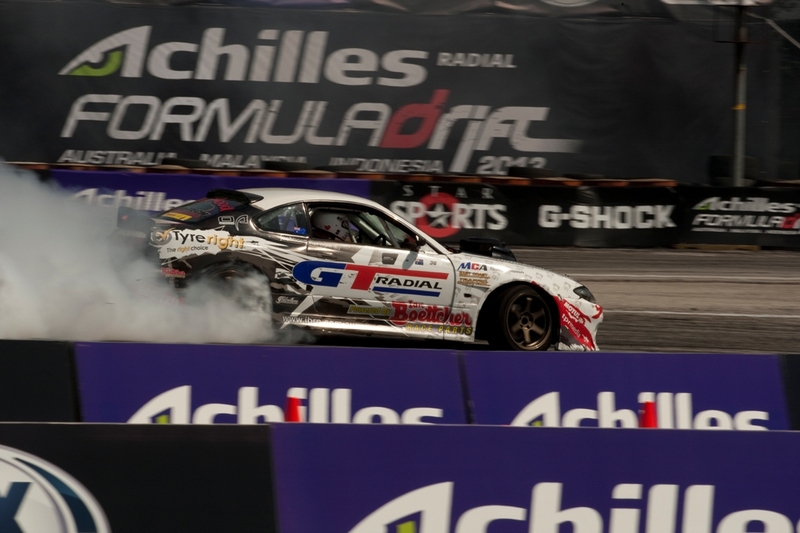 Coming home with 7th place in the event out of 33 international drivers was a good result. It means we hold onto 3rd place in the overall series and go into the final round in a strong position to take a podium place in the series. 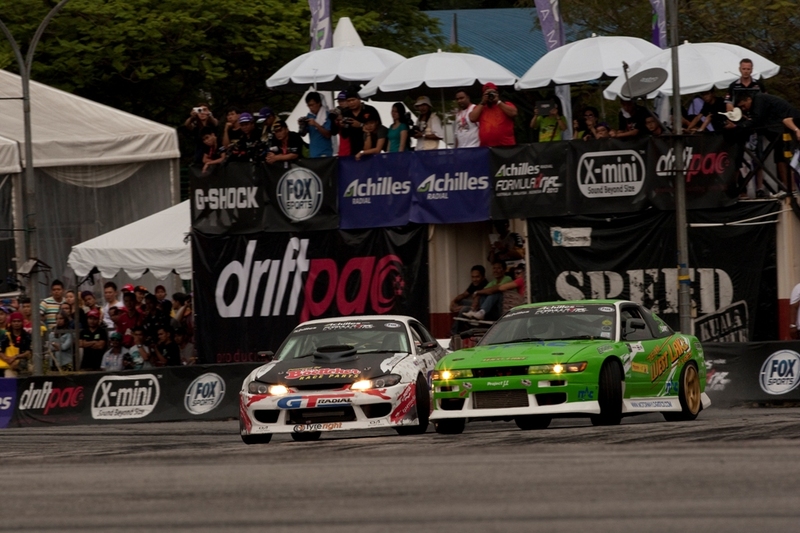 We still have an opportunity (not an easy one though) to challenge for the Formula Drift Asia championship! A HUGE thanks must go to my awesome crew, to GT Radial for making it all happen and to Ian Boettcher Race Parts and the big team of guys who helped. With an incredible effort to not only finishing the revamp in 2 weeks, but also not having anything major go wrong without even giving the car a shakedown is astounding! And of course to all of my sponsors and supporters who helped to make this event happen! 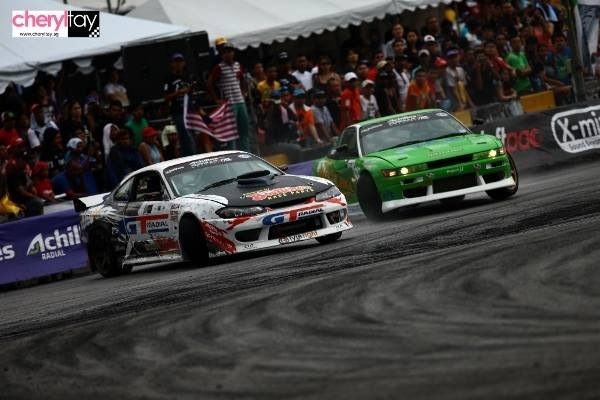 The final round of Formula Drift Asia is on November 17th in Jakarta, Indonesia. 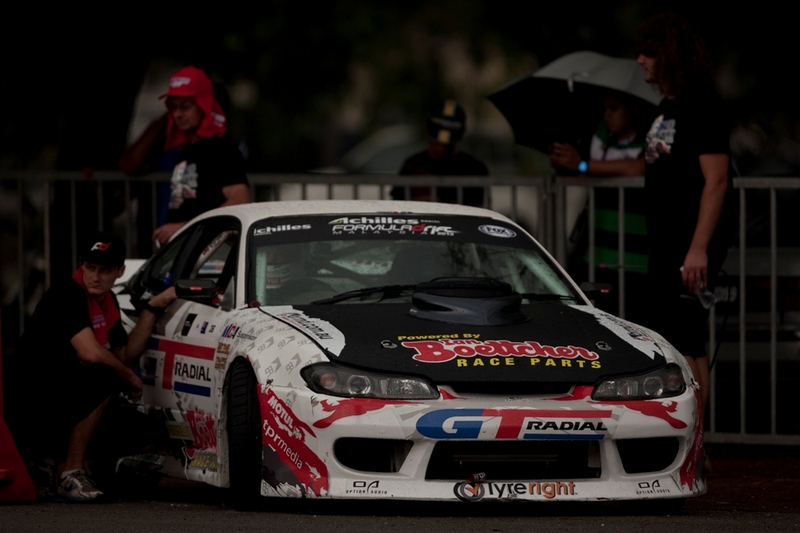 We can’t wait to get the GT Radial S15 back on track to make some more amazing noise, taking on the best in the world and seeing what we can do with a few more laps under our belt! 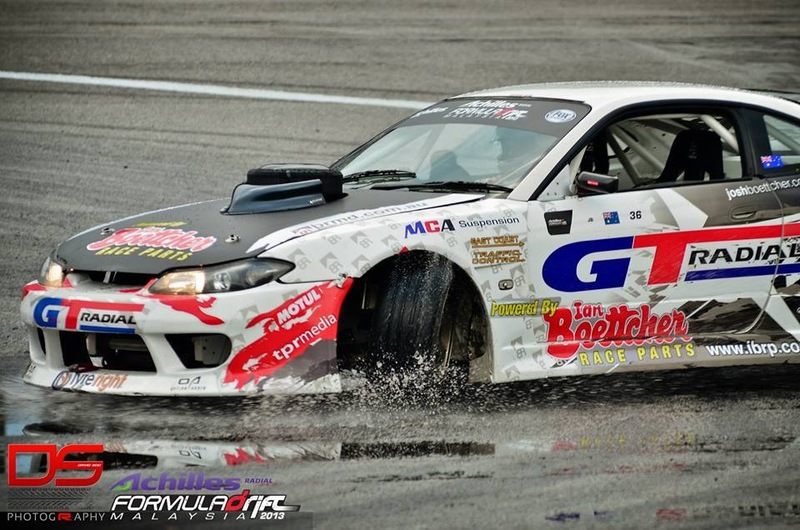 Keep an eye out for some super exciting changes happening to the Tyreright Sil80 ahead of the first round of the Australian Drifting Grand Prix in Adelaide on the 5th & 6th of October. We’re making it super competitive for the series and have a couple surprises coming up that we can’t wait to show you!